Schematic presentation of epidermis formation in mouse. At E8.5, surface ectoderm cells, lying on the basement membrane, acquire an epidermal fate. The layer of basal keratinocytes and the periderm are formed by E9.5. The innermost basal keratinocytes proliferate to produce cells that lose contact with the basement membrane, move upwards and differentiate into intermediate keratinocytes by E14.5. The basal and intermediate keratinocyte layers and periderm form the embryonic epidermis. By E15.5, the intermediate keratinocytes are replaced by a layer of spinous keratinocytes. Spinous keratinocytes are persistent in the epidermis and differentiate into granular keratinocytes to produce proteins and lipids essential for formation of the outer cornified layer. Differentiation of granular keratinocytes is complete by E16.5. 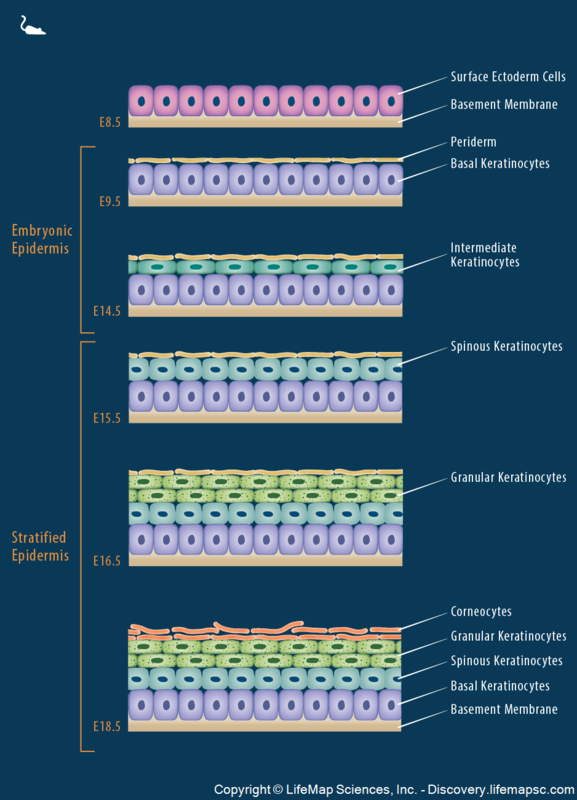 The granular keratinocytes then differentiate into corneocytes, and by E18.5, when all four layers are present, the formation of the stratified epidermis is complete.